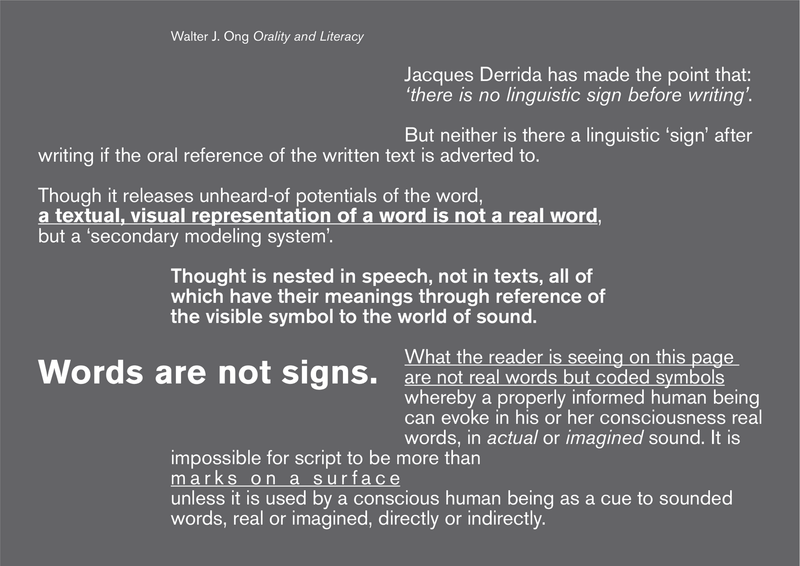 In A type primer, John Kane talks about the ‘authorial voice’, an idea that occurs in many books about typography and how meaning is understood by the reader. 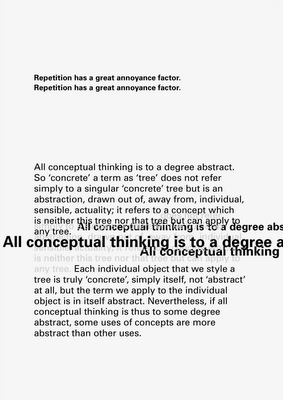 Kane suggests that typographic hierarchy is one way in which the reader can be directed to understanding a text. 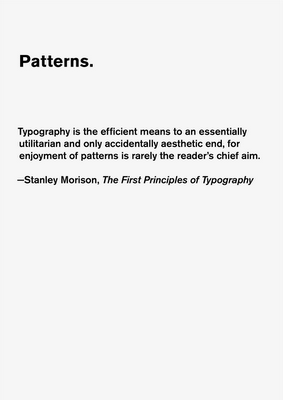 "Made popular by the International Typographic Style movement and pioneered by legends like Josef Müller-Brockmann and Wim Crouwel, the grid is the foundation of any solid design. The Grid System is an ever-growing resource where graphic designers can learn about grid systems, the golden ratio and baseline grids." "Order was always wishful thinking for me. For 60 years I have produced disorder in files, correspondence and books. In my work, however, I have always aspired to a distinct arrangement of typographic and pictorial elements, the clear identification of priorities. 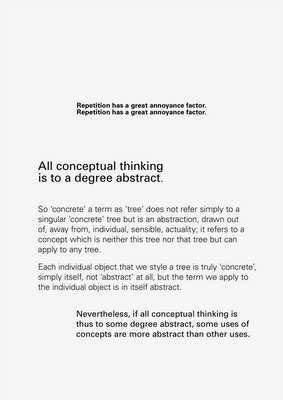 The formal organisation of the surface by means of the grid, a knowledge of the rules that govern legibility (lines length, word and letter spacing and so on) and the meaningful use of colour are among the tools a designer must master in order to complete his or her task in a rational and economic matter." 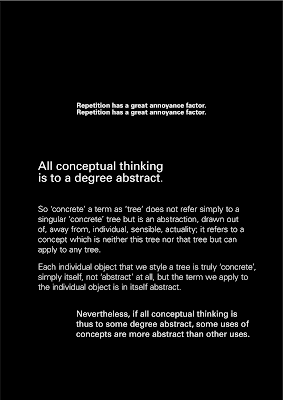 Further development of posters for Unit 2.3 Design and Rhetoric. 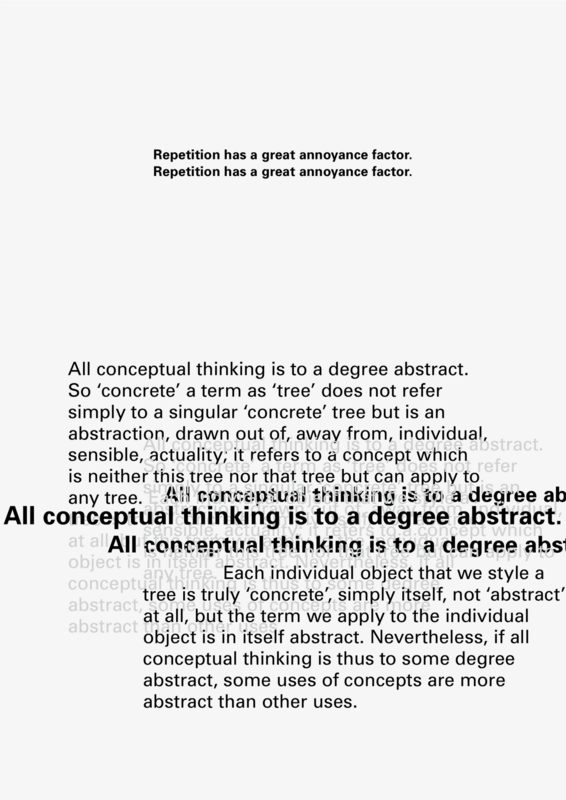 With this set of posters I attempted to make work which was much 'calmer' than the previous set and which established typographic hierarchy with a limited set of variables. 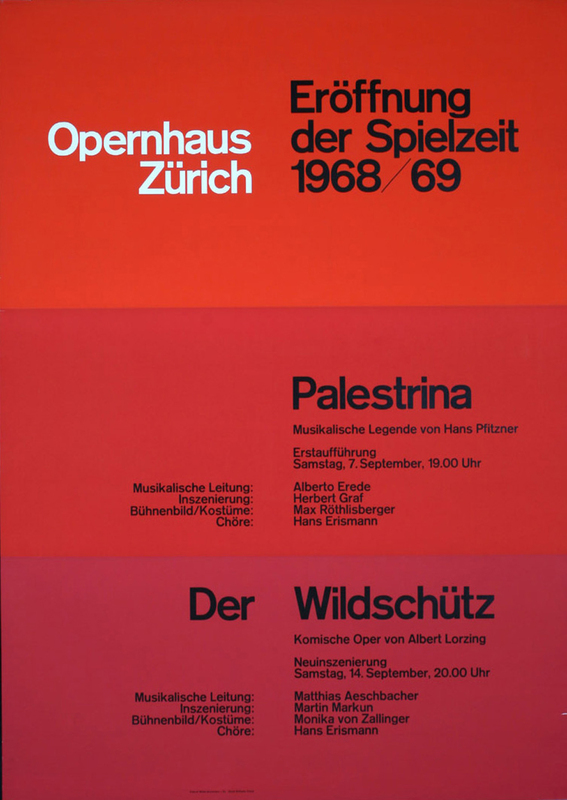 The work was informed by a reading of Typography by Emil Ruder and A type primer by John Kane. 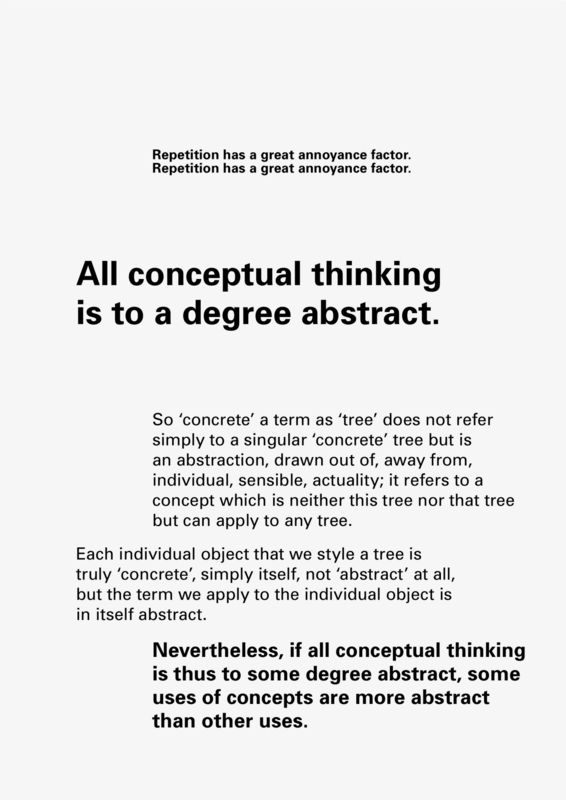 See also Typographic Hierarchy 2 & 3. 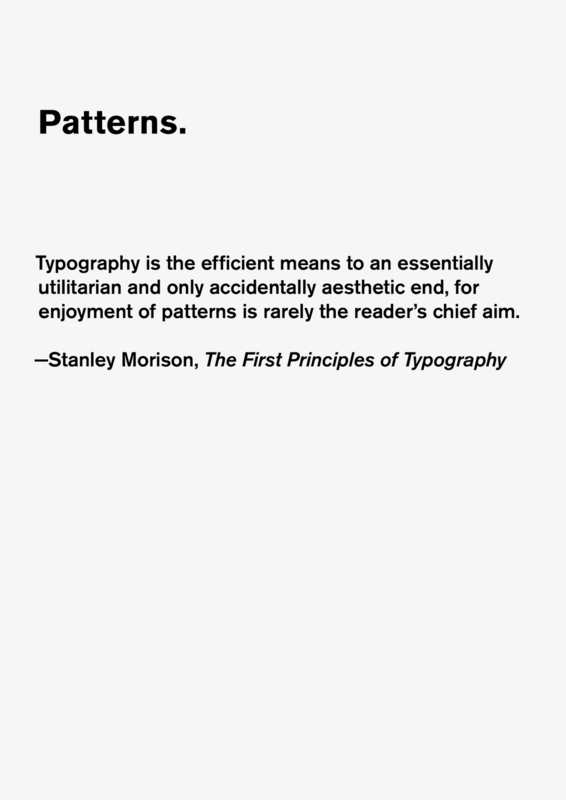 "Nothing pulls you into the territory between art and science quite as quickly as design. 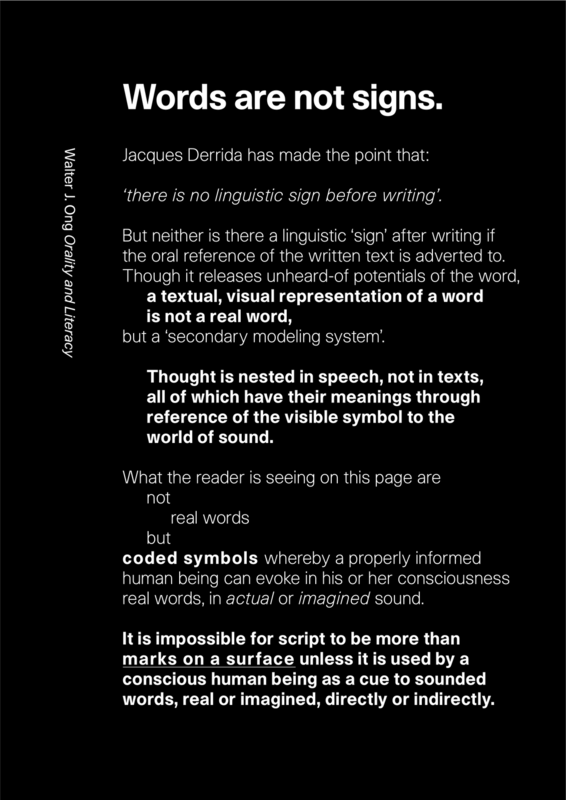 It is the borderline where contradictions and tensions exist between the quantifiable and the poetic. It is the field between desire and necessity. Designers thrive in those conditions, moving between land and water. 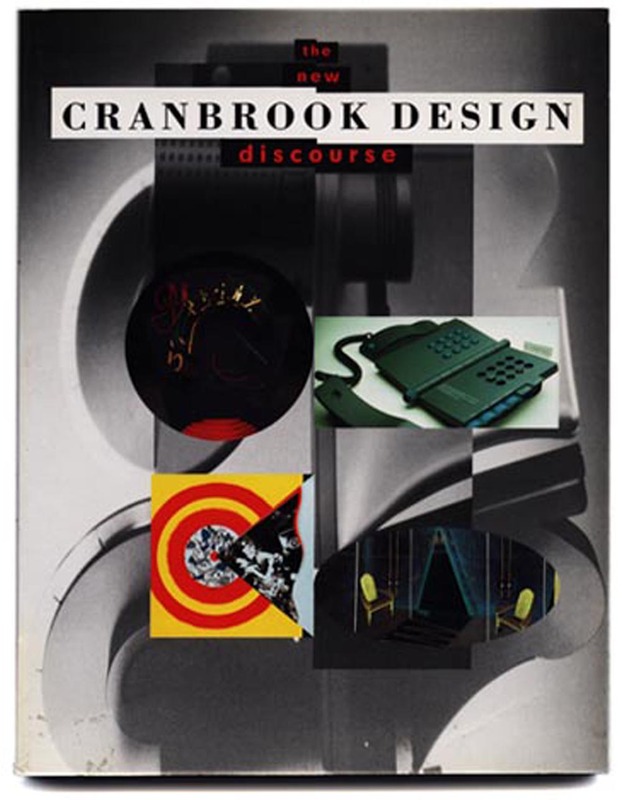 A typical critique at Cranbrook can easily move in a matter of minutes between a discussion of the object as a validation of being to the precise mechanical proposal for actuating the object. 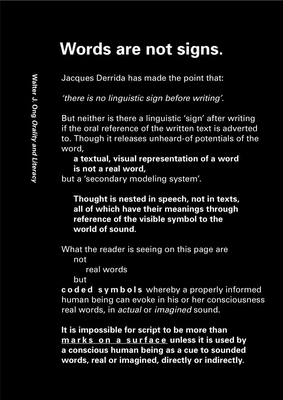 The discussion moves from Heidegger to the "strange material of the week" or from Lyotard to printing technologies without missing a beat. 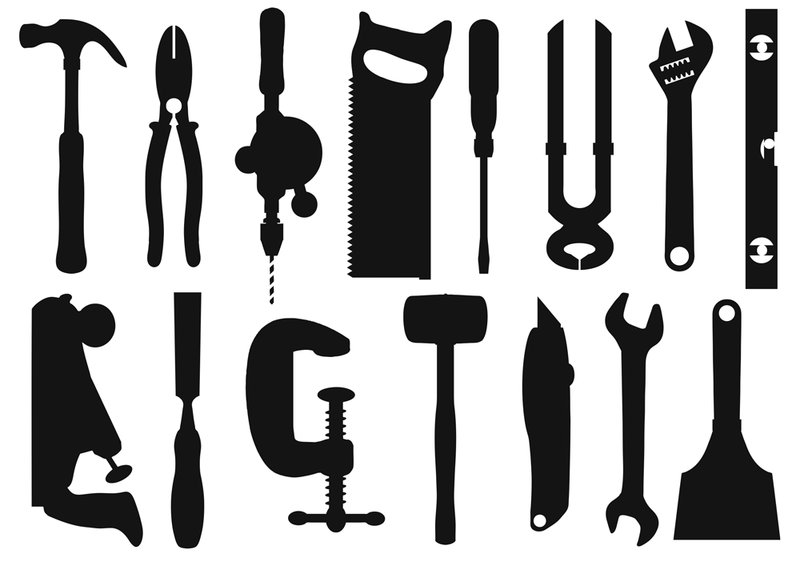 The free flow of ideas, and the leaps from the technical to the mythical, stem from the attempt to maintain a studio platform that supports each student's search to find his or her own voice as a designer. The studio is a hothouse that enables students and faculty to encounter their own visions of the world and act on them-- a process that is at times chaotic, conflicting, and occasionally inspiring." 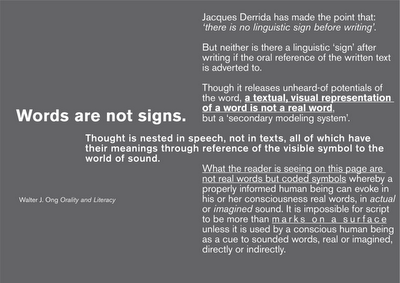 Similarly, in Left to Right by David Crow, the author looks at the cultural shift from word to image. 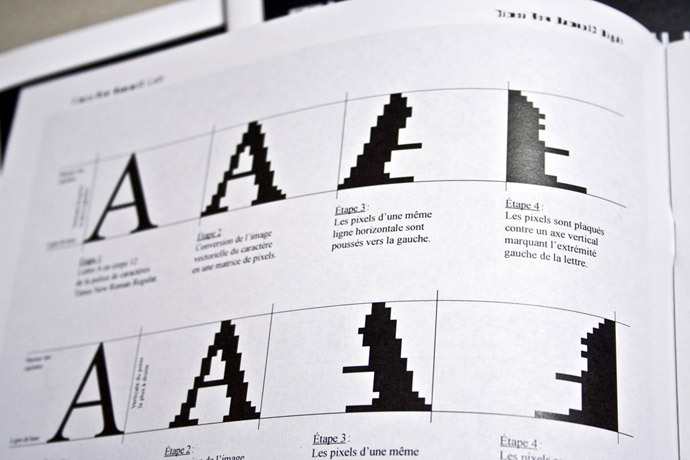 Crow examines the evolution of image-based fonts which were developed alongside shifts in graphic design production and software. Now, typing a letter on a keyboard could bring up a symbol that was entirely different from the one we might expect. 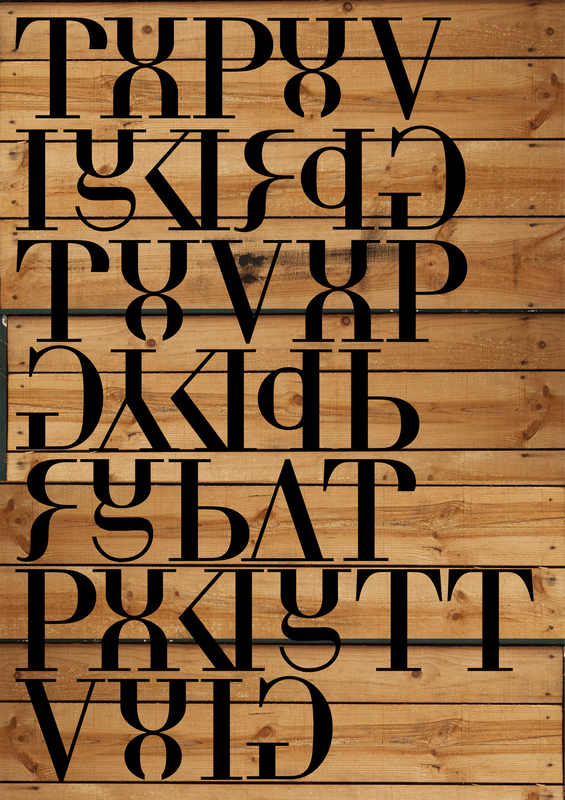 Although the fonts followed the convention of the Roman alphabet (and the interface of the computer keyboard) the result was a collection of symbols that was unreadable in the conventional sense but that, nevertheless, could be considered a language or dialect. Fuse 10 generated a huge amount of negative criticism: the main one being that freeform typography was a contradiction in terms. 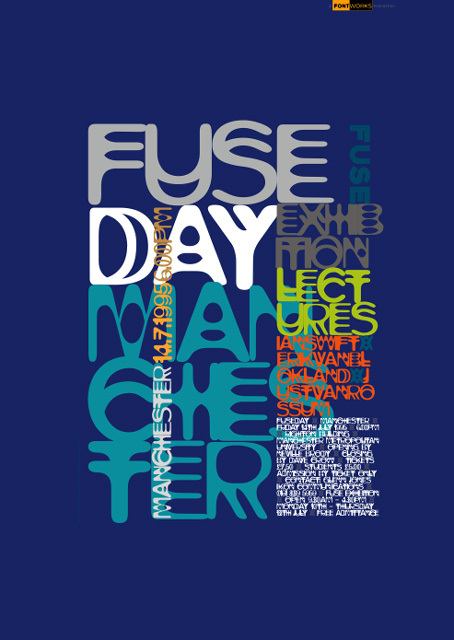 The critics of Fuse claimed that the only purpose of letters is to transmit meaning. 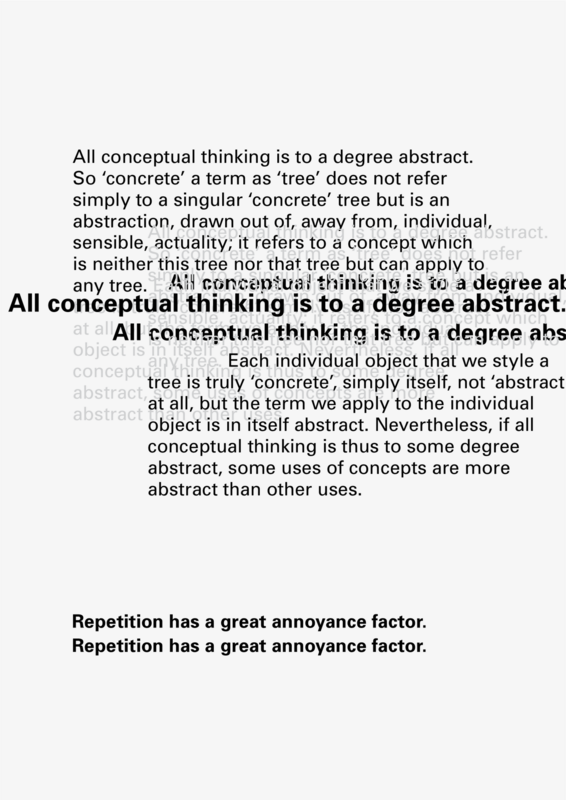 When letters are abstracted to the point that they stop performing this function, then they no longer can be letters nor, by extension, typography. 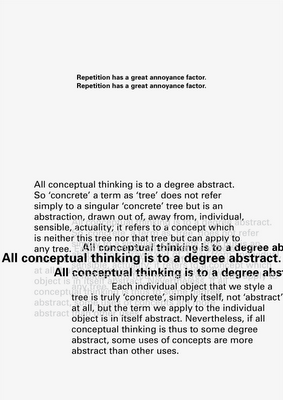 I like the idea of the text becoming one continuous text, almost like a page from a book, but I miss the sequential aspect of the book and the gradual revelation of information. I'm not sure what I will show on Wednesday. 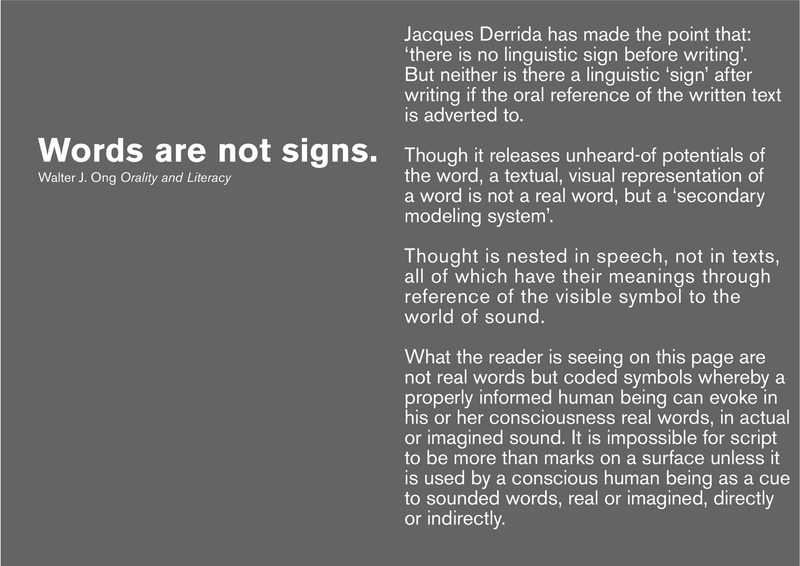 I won't have a prototype of the book - maybe I'll show some colour copies of the posters and some spreads from the book. 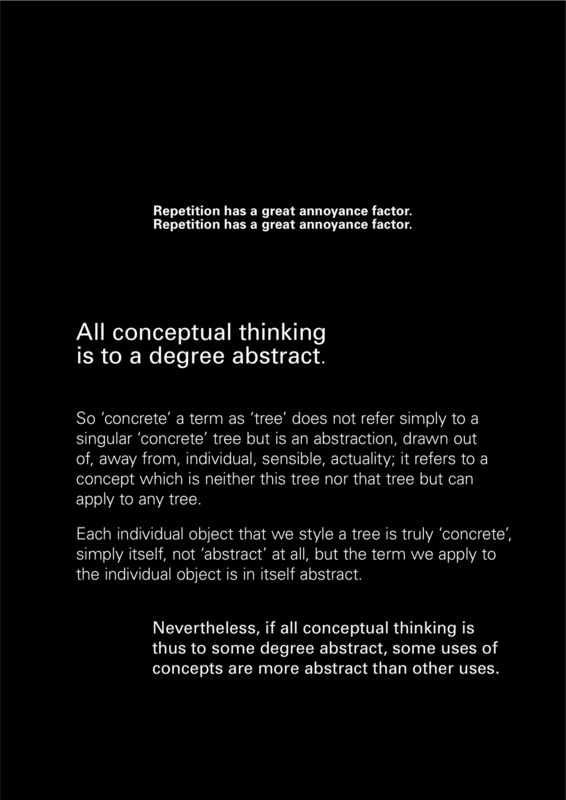 The form of the word and the meaning of the word i.e. 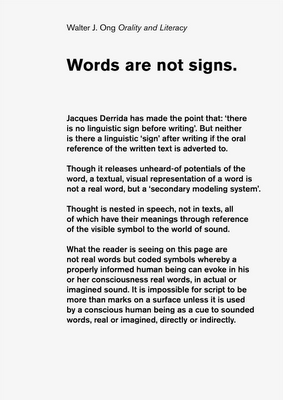 the signifier and the signified is arbitrary: the sound of the word and its written form has no relation to the thing itself. 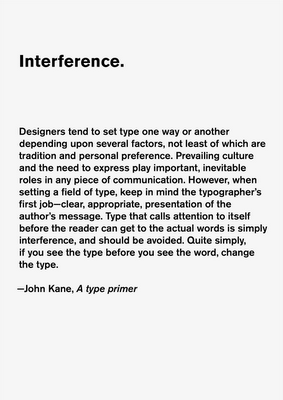 ‘A type primer’ by John Kane contains a really useful introduction to the history of the alphabet. 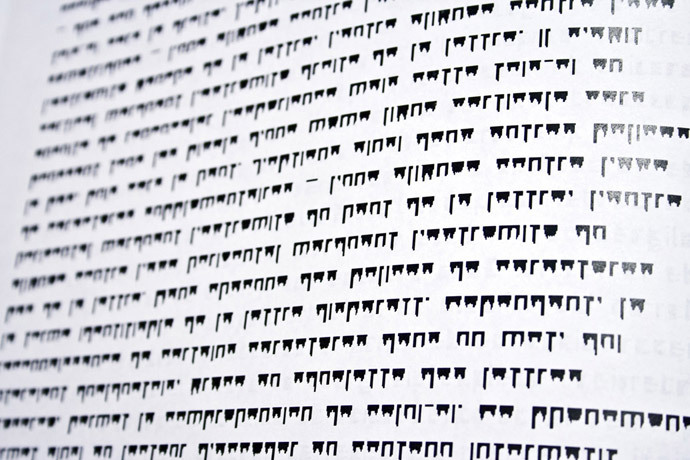 Kane charts the development of the alphabet from its roots in Phoenician votive steles, dating from 4th century B.C.E. 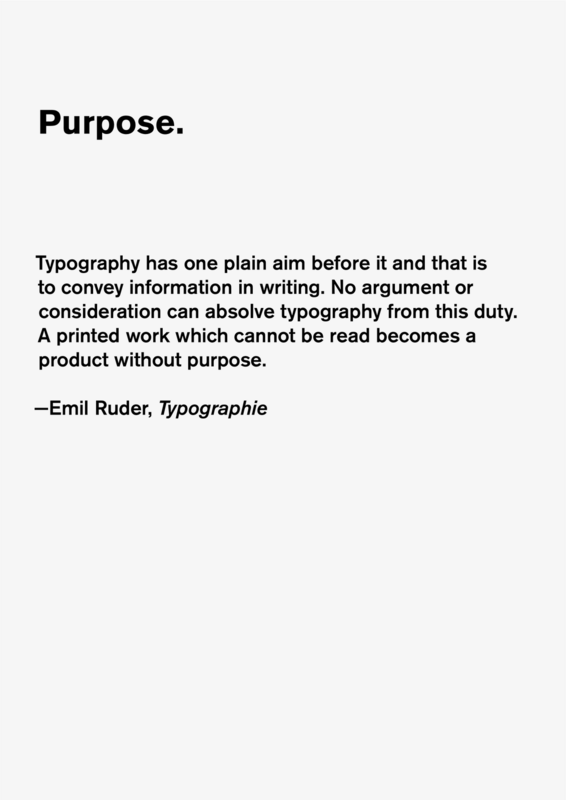 and found in Carthage, Tunisia where the text was scratched into wet clay with a pointed stick, through to Adrian Frutiger’s grid of the various weights and widths of Univers, released in 1957 for the new technology of photo typesetting. 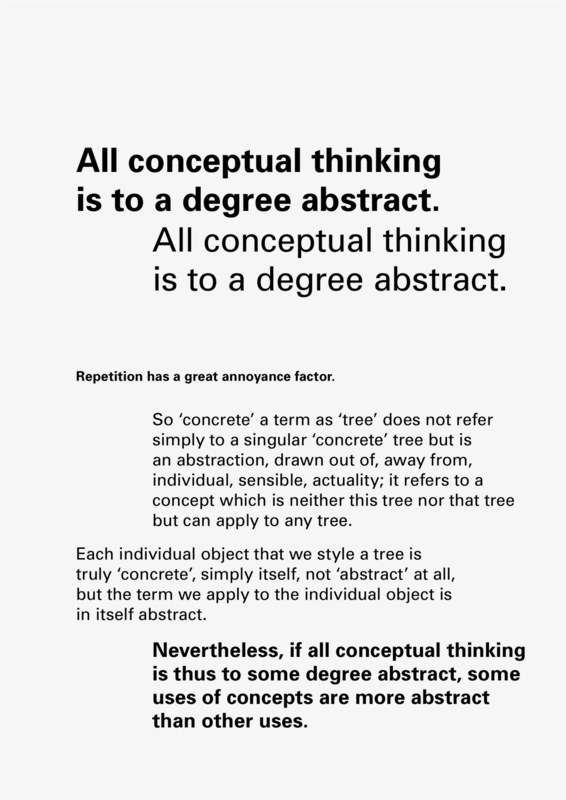 Further development of posters for Unit 2.3 Design and Rhetoric. 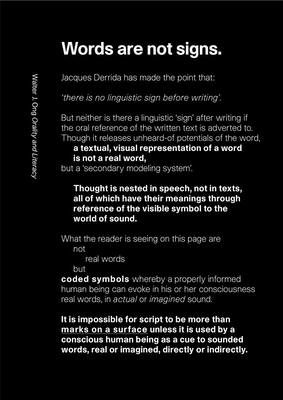 My research in unit 2.3 Design and rhetoric has focused on language, in particular the relationship between speech, writing and typography. 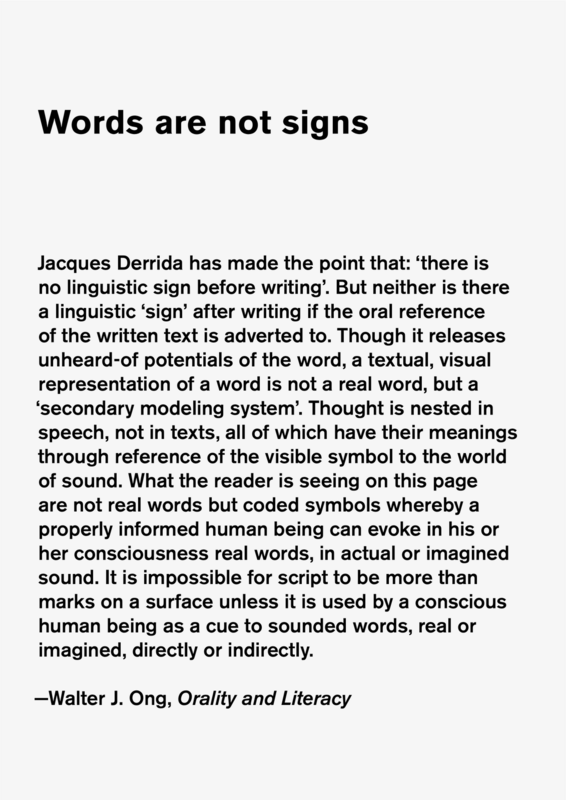 I am interested in the idea of typography as a faulty transmitter, a language at one remove from writing, which, in turn, is a language at one remove from speech. 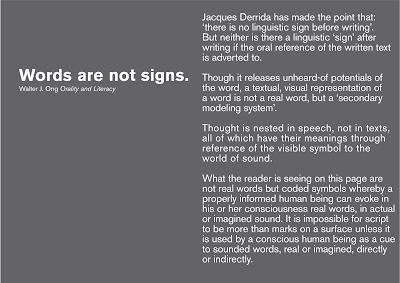 Language is constructed from a set of units called phonemes - these are the sounds from which words are constructed. The meaning of the individual phonemes disappears as they are joined together – in limitless ways - to create words. 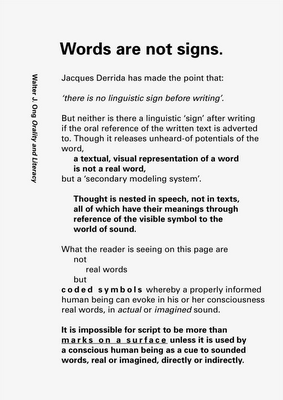 Language, then, is a system of representation: a letter represents a sound; a word (a collection of letters) represents an object or rather, a mental picture of an object. 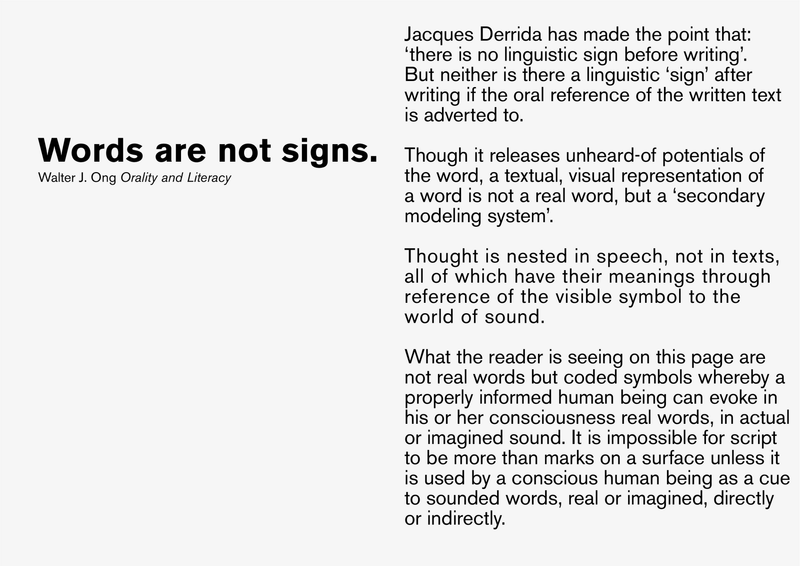 A word contains two parts: the signifier and the signified, a sign is produced when these two parts are brought together. 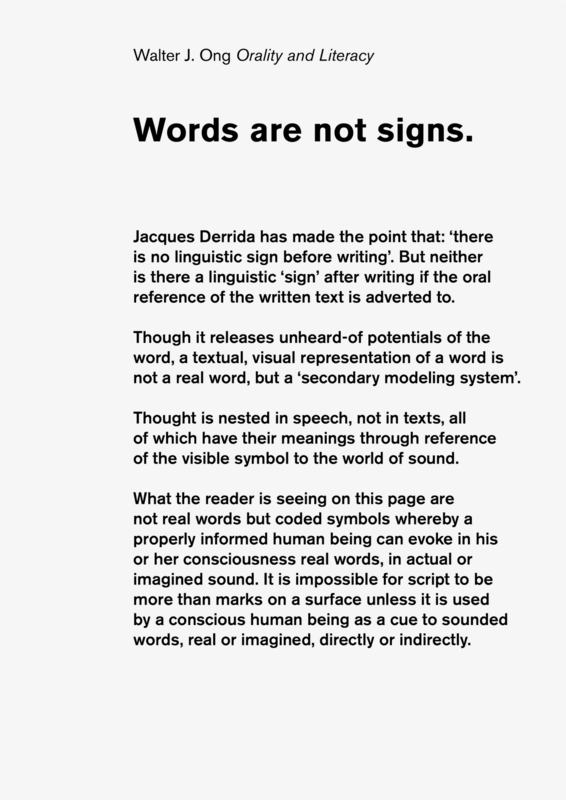 The relationship between signifier and signified is arbitrary: in different languages, different words signify the signified: a different set of phenomes is used. 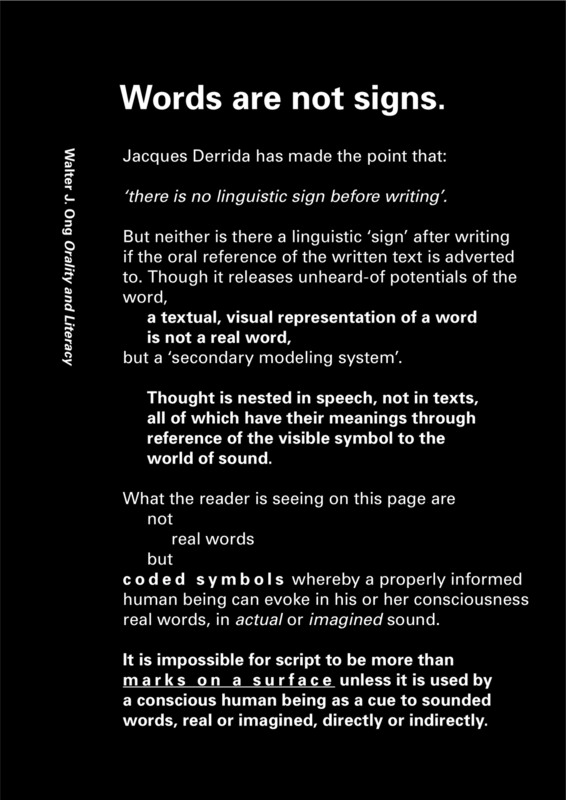 In every language these phenomes are arbitrary: the word used to signify an object bears no relationship – either in its spoken or written form – to the thing itself. Here are my tools drawings re-scaled so that the clamp (hopefully) no longer dominates. All have been scaled so that they relate to each other more successfully - though the scaling isn't necessarily true to reality. And here are my glyphs. 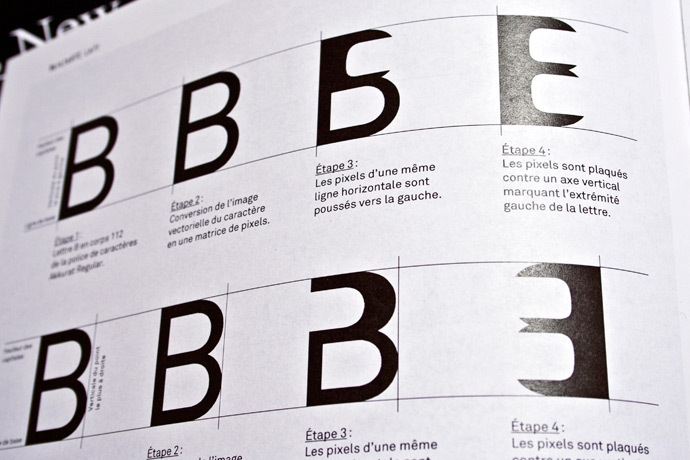 The glyphs are based on the typeface Akkurat. 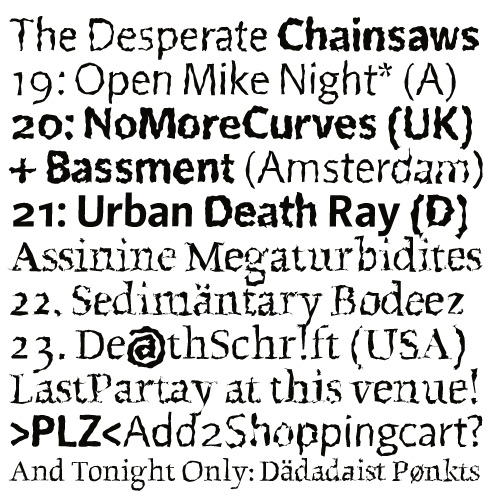 Some glyphs are proving to be more problematic than others. The clamp has been through many stages and the chisel through 11 different versions. The main problem was that my drawings had become very symmetrical. 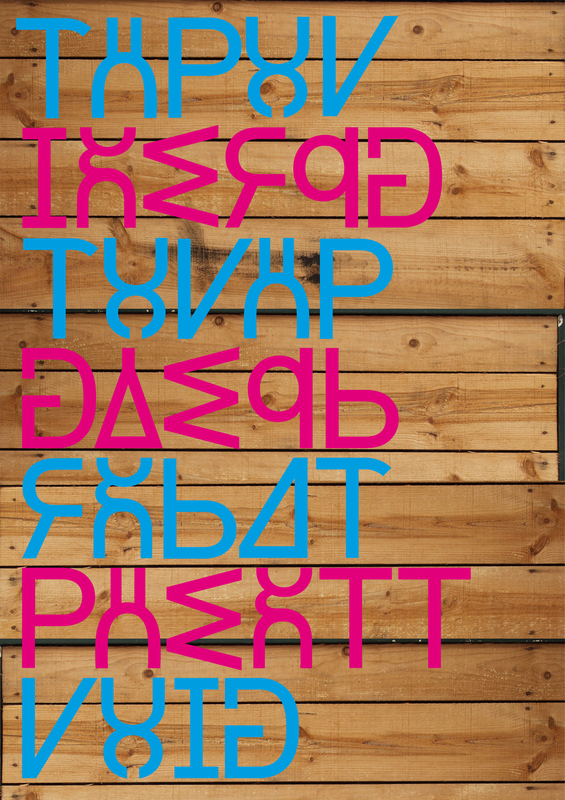 I needed to break up the symmetry in the glyphs to create more of an interesting relationship between the glyphs. I love the spanner! 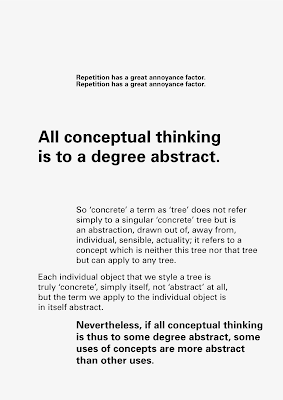 Development of posters for Unit 2.3 Design and Rhetoric. 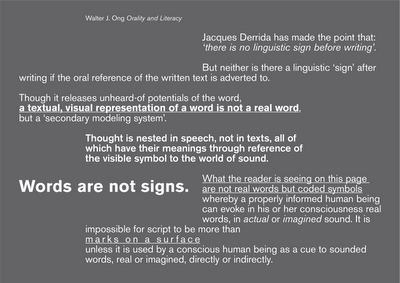 Text from Orality and Literacy by Walter J. Ong. 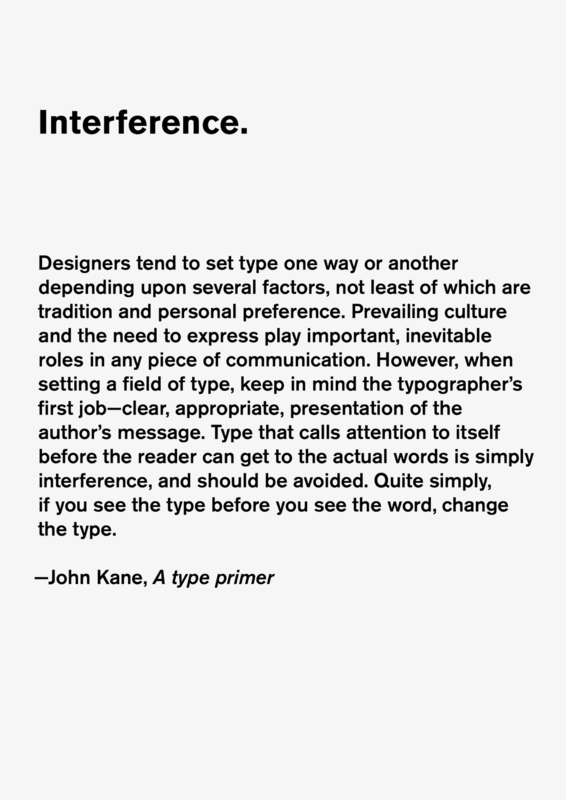 I have been thinking about the differences between expressive typefaces and expressive typography. 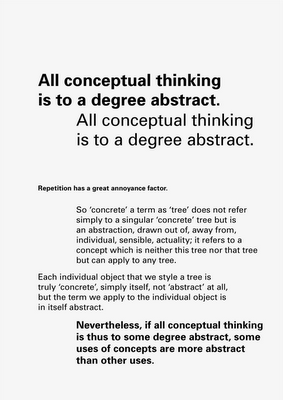 For me, expressive typefaces are typefaces that have a strong character: a good, but obvious example, would be Comic Sans. 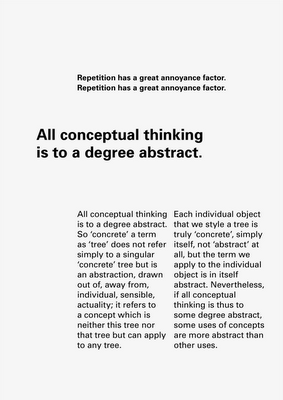 Expressive typefaces shout ‘personality’ in a manner that is emphatic and prescriptive; it is difficult to subvert or alter the meaning of the typeface as it is so enmeshed in its DNA. Expressive typefaces are often used as display faces because they draw attention to themselves and are unsuitable for extended reading in body text because of their idiosyncrasies: the individual letterforms jump out. 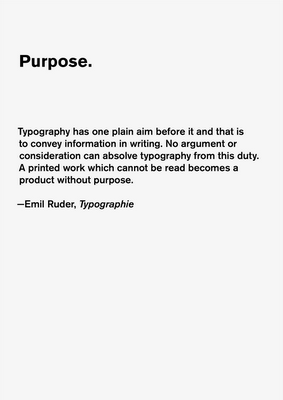 This can also be true of typefaces that are not generally considered to be either display faces or expressive: Rotis by Otl Aicher, for example, has many peculiar features that disrupt the reading experience. 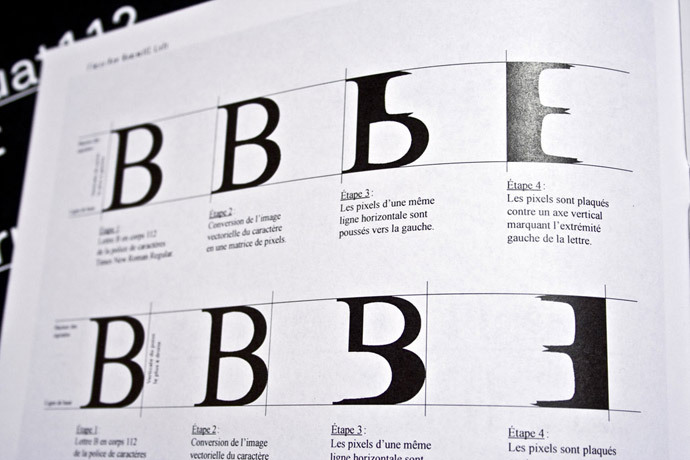 “It takes a poor typographer to be convinced that letters are only meant to convey meaning. 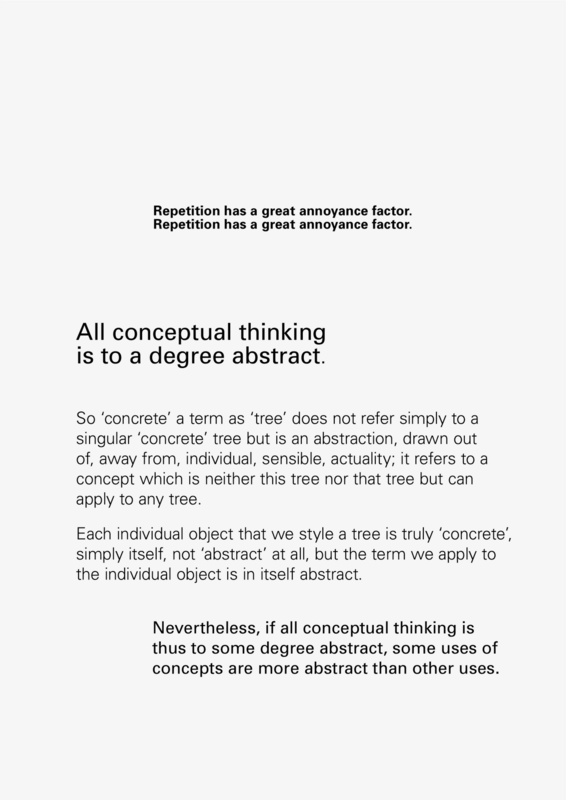 If you follow this line of reasoning you could also argue that a plane is the same thing as a bicycle, “because it transports people from one place to another.” Just like there are different modes of transportation to get things from one place to another, there also are different kinds of letters to communicate different types of messages. Do these ‘tools’ have a correlation to mark-making in drawing? 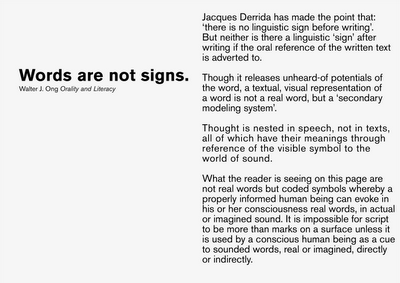 I wondered if this might be a possible line of enquiry for my Design and Rhetoric research. Would it be possible to analyse the meanings of these marks? 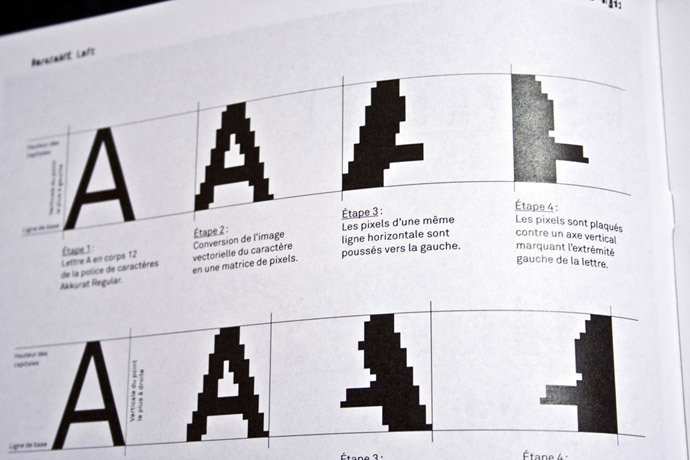 Is it possible to analyse typography in the same way that one can analyse the marks in a drawing by Matisse? 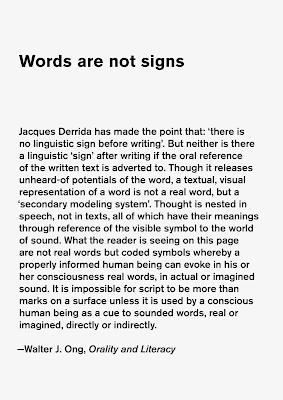 I found it interesting that in ‘The Graphic Language of Neville Brody’, Jon Wozencroft used a language to describe Brody’s practice that an art historian might use to describe fine art practice. Akkruat 12 & 112 and Times New Ramon 12 & 112 typefaces in four styles (Left, Right, Up and Down) made according to the transformation process of the area occupied by each letter in 12pt and 112pt size Akkurat and Times New Roman typefaces. "The protocol I have set up first consists in pushing all the pixels of a same horizontal line to the left, sticking them to each other. 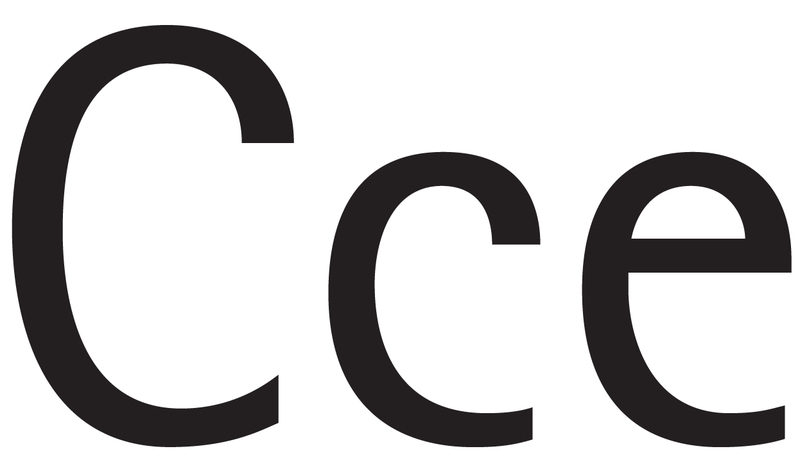 The pixels are then flattened against a vertical axis that marks the left edge of the letter, while respecting the skeleton of the chosen basic character. The shape obtained covers a similar surface as the original drawing – but with a different outline. 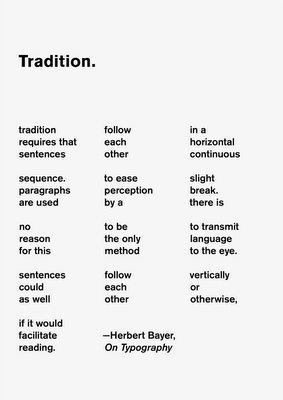 By repeating this process towards the right, then upwards, and finally downwards, we get four variants of a typeface (Left, Right, Up, and Down)." 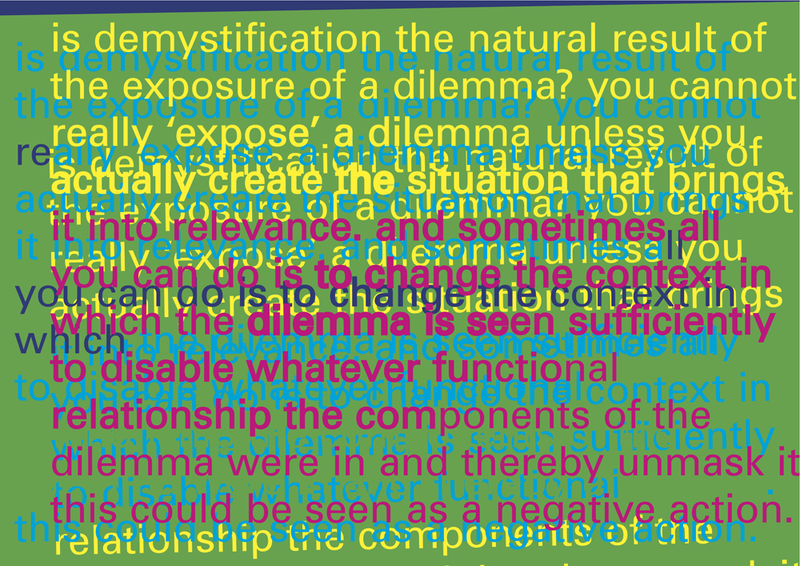 Is it possible to make typography that enhances the content of a text in a manner that is functional i.e. 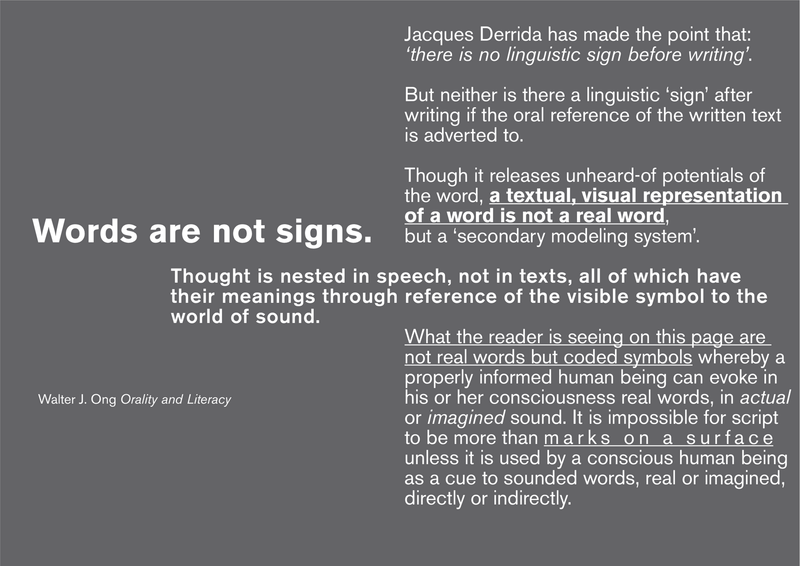 readable but that does not resort to superficial visual tricks to amplify meaning? 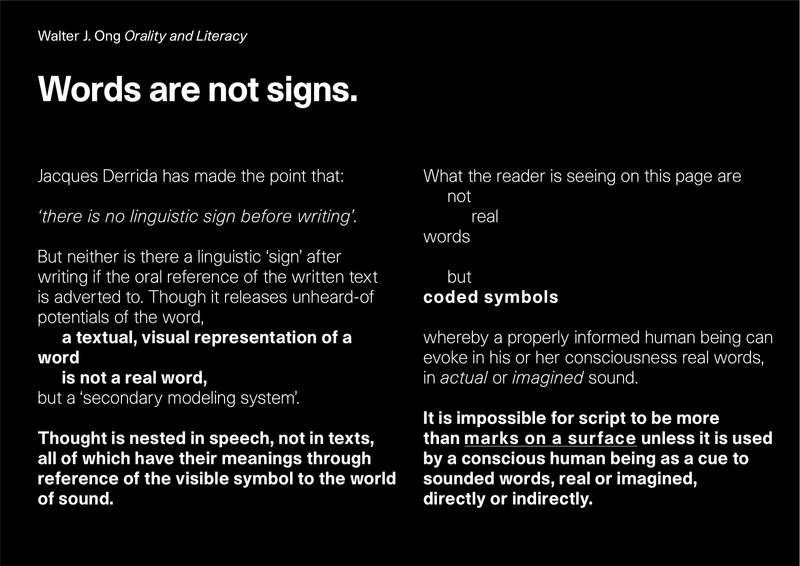 To examine the relationship between language, text and typography. To develop an understanding of the nuances of typography, particularly typographic hierarchy and the extent to which the reader can be controlled or manipulated by these interventions. 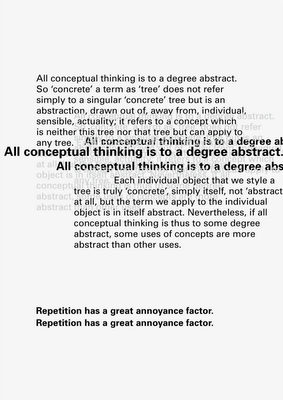 To further develop the polarised debate that dichotomises Modernist typography against post-Modern typography. 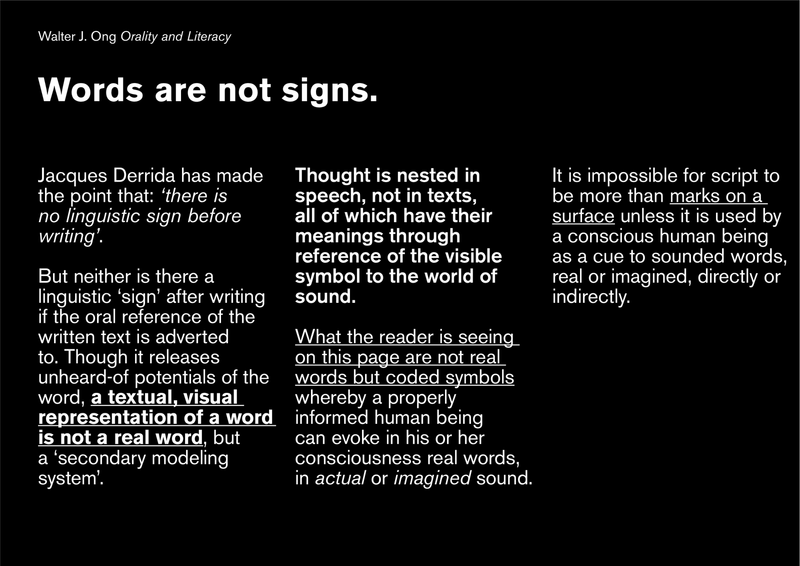 To create a way forward that melds text and typography to reinforce meaning. 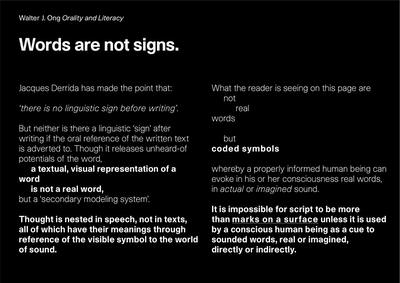 Visually-literate readers: publishers, artists, typographers and designers. 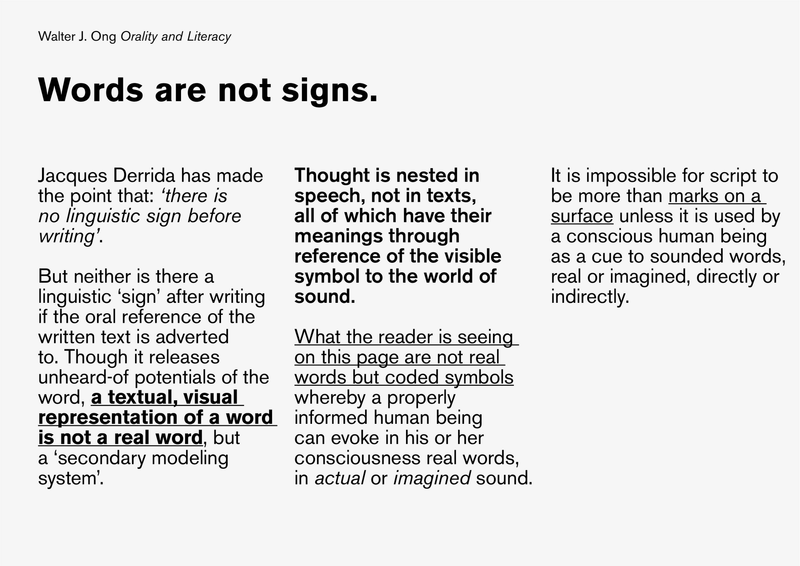 My initial idea was to work with chapter-length, continuous texts, however, my outcomes in unit 2.3 have been posters – as there is a difference between design for posters and design for books, my initial research will look at posters and shorter texts. Left to Right by David Crow has been a good introduction to the area of study. 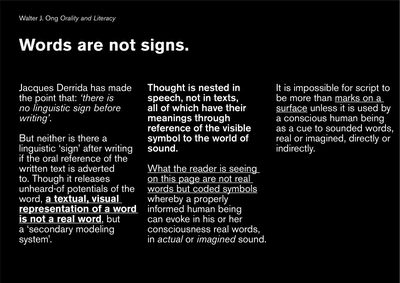 Orality and Literacy by Walter Ong has been a great starting point for thinking about the relationship between between language, text and typography. 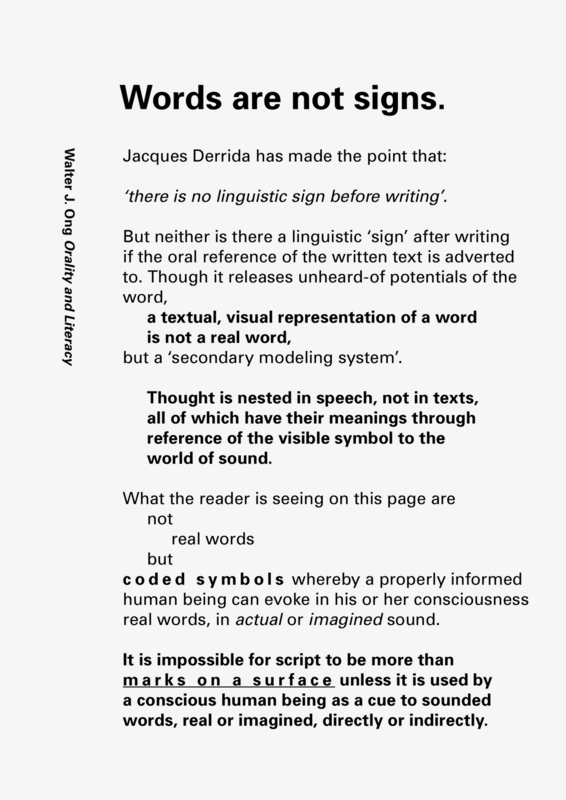 On Typographic Signification by Gerard Mermoz has helped crystallise some of my ideas and has pointed the way to further reading and research. 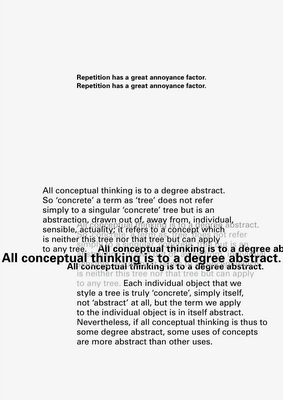 Bridget Wilkin’s essay Type and Image has been a starting point for thinking about the potential for typography to exist in spaces outside of the modernist grid. 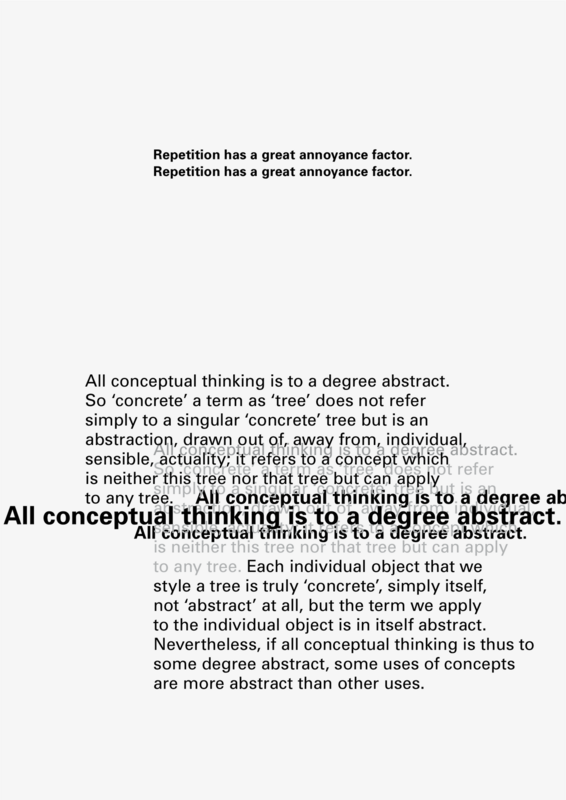 Generate a series of works that explore typographic hierarchies. 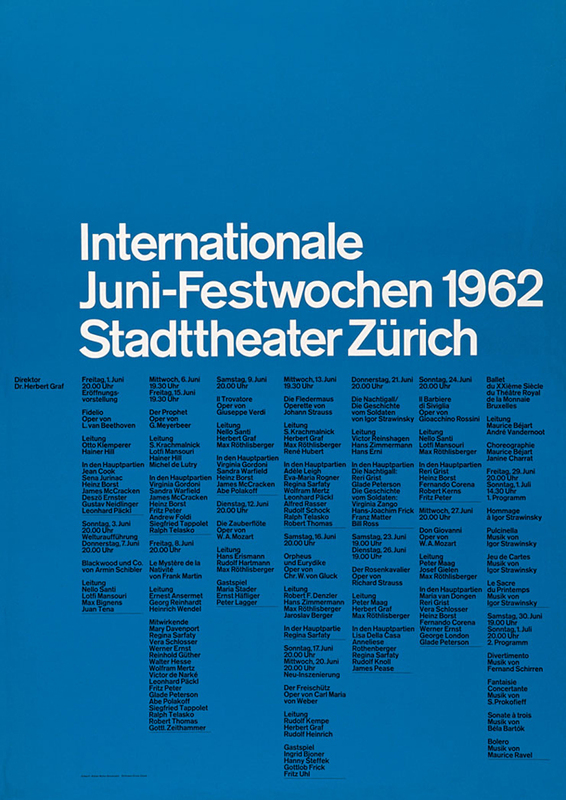 Research typographic hierarchies within early and mid Modernism, in particular, the work of Josef Müller-Brockmann, Emil Ruder and Armin Hofmann. 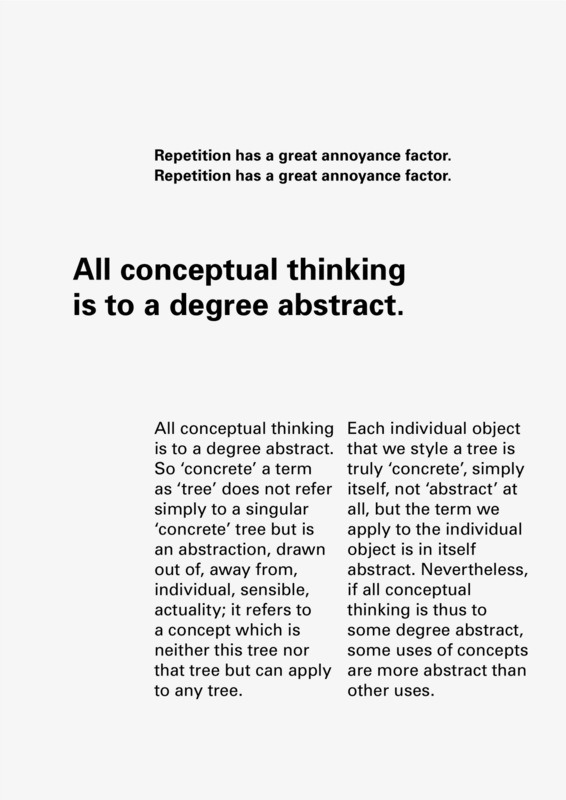 Survey typography by Wolfgang Weingart, Rudy van der Lans, Catherine McCoy and April Greiman - and more recent work by APFEL and Marian Bantjes. 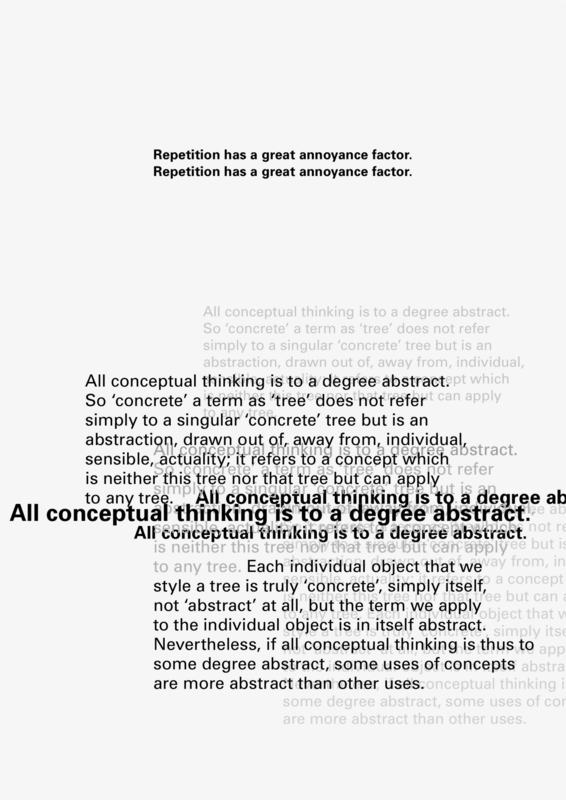 Research other forms of typographic information eg. Road signs by Jock Kinneir and Margaret Calvert? The Alphabet versus the Goddess by Leonard Shlain. My starting point is the absence of Dracula in the original text - he exists mainly as an idea and there are few descriptions of him; he becomes a monster created by our own minds. There are 34 references to 'Dracula' in the entire book (and 104 references to 'blood'). 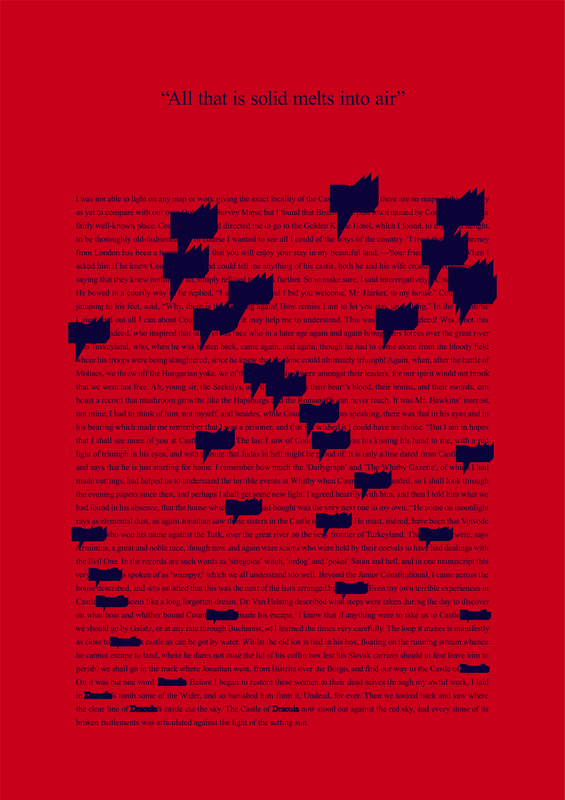 I collected together all the sentences that contained the word 'Dracula' to make a kind of parastic book based on the original novel. There are two versions that I have been working on. In the first I systematically increased the stroke weight of the word 'Dracula'. I experimented with different faces but Times was the most effective. 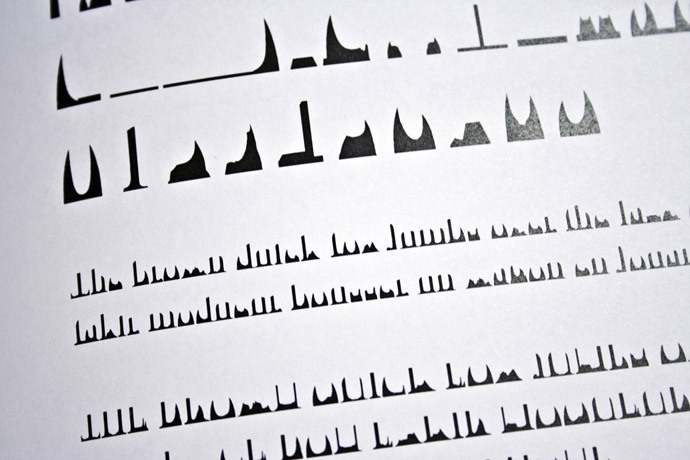 After 34 iterations the word 'Dracula' became unreadable - a spiky monster, that could almost be a bat, appeared. 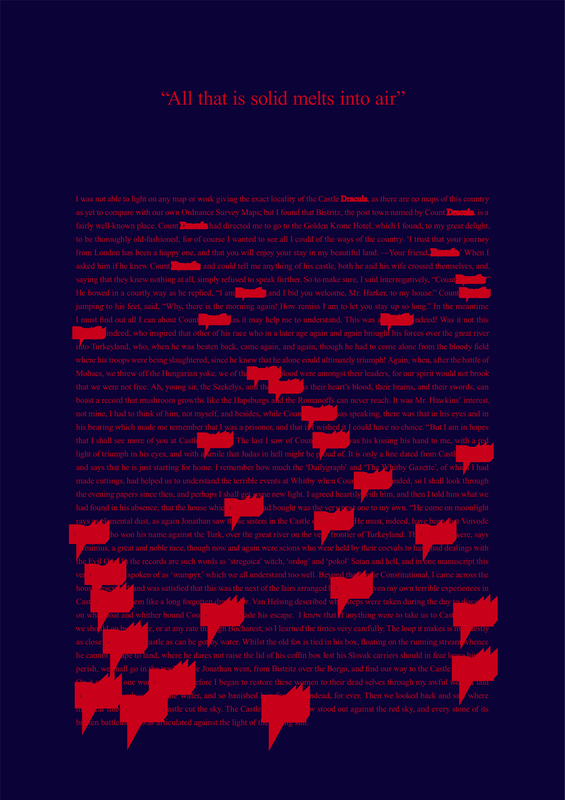 In the second version I systematically blurred the word 'Dracula' over 34 iterations until the word disappeared. The more we read about Dracula, the more elusive he becomes: "All that is solid melts into air". There is another version which uses a similar technique with the 104 references to blood. The narrative becomes a condensed version of the full story, I've called it 'Filthy Leech' because of its bloodsucking relationship to the original text.